DESCRIPTION: Portals Plus insulation Breathers and Vents are used to prevent moisture vapor from becoming trapped in the roof system, equalizing air pressure, reducing the risks of ballooning, blow-off, deteriorating insulation and separating deck seams. The Portals Plus Vents have a one way valve designed in the unit to prevent moisture from re-entering the roof system. The Portals Plus Breathers allow for both exhaust and convective movement of air between breathers. Both the Breather and Vent are available in heavy gauge spun aluminum or black high-density polyethylene with a locking, vandal proof cap that shields against entry of wind blown rain or snow. SPECIFICATIONS: Install at a spacing of one per 1000 square feet. 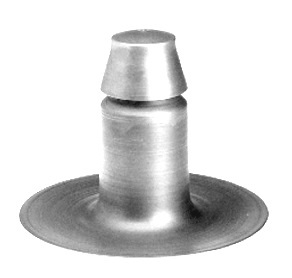 The Aluminum Vent is made of .050 spun aluminum with a base flange diameter of 12" and a height of 9". The stand pipe has a 4.25" base opening and a 2.75" counter flashing rain cap that locks and is vandal proof type. Aluminum Insulvent One-Way Breather Vent, 8-1/2 High, 10-3/4 OD Flange, 4 Inch ID Base Opening. Price/Each.